Have not been up to a whole lot of anything much, did take a cruise to the Bahamas in Oct. of 2012 it was nice and I really liked Key West. I have been riding my motorcycle as much as I can when the weather is nice. Worked in school transportation for 28 yrs. Married twice, now living in Moore with 2nd husband of 20 yrs and life is great. Ended my career as a Supervisor and driver trainer for Moore Public Schools. Planning on going into buisness for myself training drivers for school districts. Ended up going back to work for Moore-Norman Tech Center in Sept. of 2012 and really like it. Our PE teacher use to let Jan Cartmill and I go out and get lunch early as long as we would bring her something back. Was great plus a lot of times we did not have to dress out for PE. I hated that. 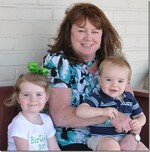 Cheryl Glasgow Mason updated her profile. View.